Shiny Aluminum Floor Mats Protect Your Vehicle in Metallic Style! Aluminum car floor mats are for car enthusiasts who love the shiny metal look and don't mind the hard metallic feel. They are easy to clean up and make shiny but you might catch your shoe on a mat edge. Lots of pros and cons with this kind of mat means you should take extra care in choosing which one is best for you. Here's some of the manufacturers. Owens Aluminum Floor Mats with a diamond plate design. Wow! Shiny, tough, invincible, real guy mats! What other words are there to describe these thick aluminum mats that Owens Products calls Lazer Floor Shields and manufactures by hand to custom fit your vehicle. You can still buy these mats at Mats4Less but as of 10/16/2014 Owens no longer manufactures these mats. You may also be able to pick them up at such retailers as J.C. Whitneys while supplies last. 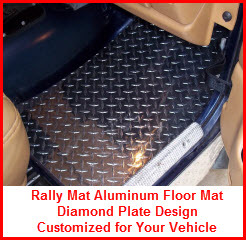 In addition to the Owens Lazer Shield Mat the Aluminum Diamond Plate Floor Mats from Rally Mats should be on your short list of aluminum car mats. The mats are CNC machined to a close specification for your vehicle and have superior wear properties(it's hard to rub your heel through aluminum plate). They don't rust, give you good traction and cleanup quickly with soap and water. So give Rally Mat a call and ask them to make some floor mats for your car or truck. Keep your feet dry and keep water from infiltrating between aluminum car floor mats and your vehicles carpeting by using a universal absorbent car truck floor mat protector. It'll also reduce odors from mold and mildew at the same time and possibly prevent the carpet from rotting. In a pinch these Rally Mats aluminum floor mats can substitute as decorative chrome mats for that special restoration project you're working on. The edges of these mats are hand finished so you don't have to worry about getting cut or snagging your pants. The color is about the same as chrome and they are made in a diamond plate pattern. Or maybe there's a party you're planning in your car and your need a durable party mat. In any case keep them really clean, polished and shiny. They'll make you happy forever or as long as they last, whichever comes first. American Car Craft also manufactures a beautiful line of aluminum car floor mats. These babies are custom designed, hand formed and highly polished. What's better is they come in powder coated black, blue, yellow, orange, red and natural aluminum. They install using 3-M double sided tape and fit nice, especially if you follow the detailed instructions that accompany them. A lifetime warranty tops off the deal. So upgrade your Vette, Mustang, Pontiac G8 or other high performace beast of a vehicle with one of these custom fit American Car Craft aluminum car mats. An alternative to the Owens Lazer Shield, Rally Mat and American Car Craft aluminum car mats is the Diamond Plate Mat from IntroTech. It's not a solid metal plate but is essentially a vinyl mat surfaced with a thick metal foil. 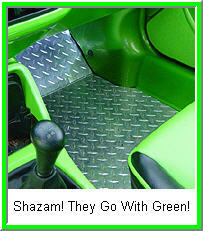 It's more flexible and is custom fit for your vehicles floor pan. One difference between the Intro-Tech mat and the Rally mat is that the Intro-Tech floor mat is custom fit to your vehicles floor pan and is ready to be installed. The Rally mat is cut to spec for your vehicle but still has to be bent and manipulated to make it fit just right. So if your not a big he-man or she-woman and don't want to be bending some pretty thick aluminum sheet on a table corner go for the Intro-Tech mat. But if you're ready for a physical challenge, like to bend stuff and really want the metal look and feel, then the Rally Mat might be for you.